Hey there Italy! On to a new country today. 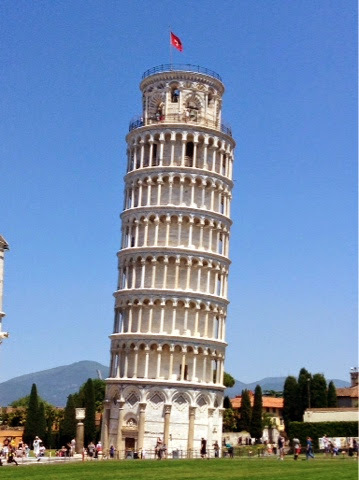 It was another driving day, but we did get to make an exciting stop to see the Leaning Tower of Pisa. It was a bit surreal to see something so iconic in person, especially when it seems impossible that it stays up! We took the usual holding up the tower photos, then had a look around the markets nearby and found some Italian gelato. Later we arrived at our campsite just outside Florence and it was absolutely boiling! Definitely the hottest day of the trip so far, so we spent an hour or two lazing around and frying in the heat. After dinner our tour manager took us out to a karaoke bar. A few of us were a little skeptical, but it turned out to be an amazing night! Once everyone had a few drinks in them they were fighting to get a turn on stage, and the whole room was singing along to everything anyway. And when we got back to camp we were able to get pizza from the bar, which was an excellent way to end the night!